it’s been a while… I’m one busy mama of a 3 year old and a 4 month old. I’m currently training for the marathon, and update daily on instagram. 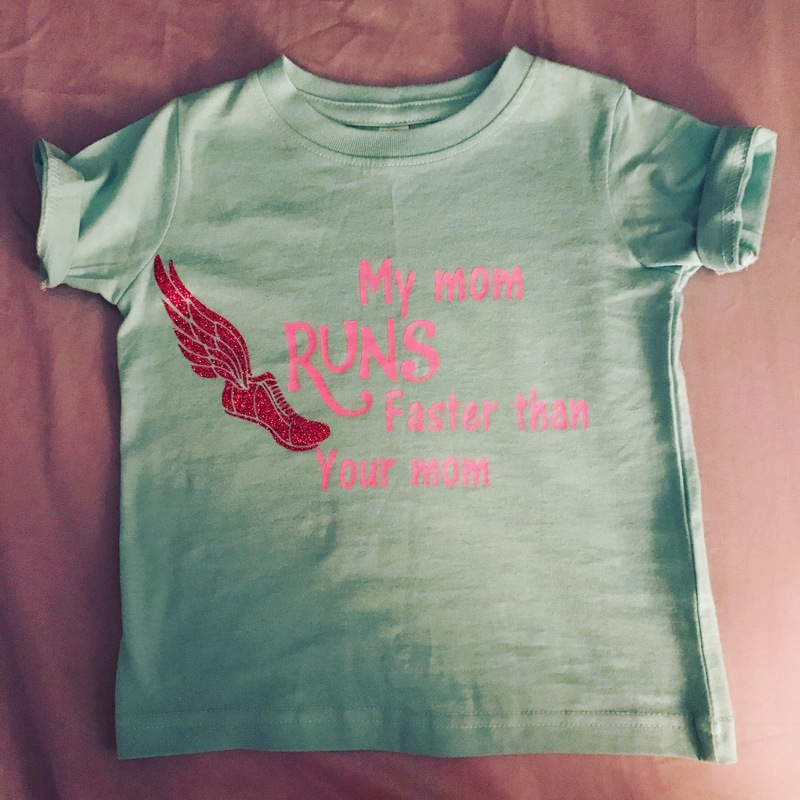 However, plan to start updating the blog with a lot more running content, including my marathon journey postpartum. Hope to have you follow along! Lately, if you have been following along on my Instagram @sweat1xdaily, you’ll know… I have been running my long run on Friday night. However, this last Friday, thunderstorms were rolling in at night, and my training plan called for a 14 mile long run. I decided that I was going to run 7 quick miles to get done before the heavy rain started, and run my 14 mile long run on Saturday instead. My 7 miles felt amazing on Friday night, the breeze came and rain sprinkled during my last mile. Saturday was a different story, I didn’t wake up early enough, and had a long day of errands. I headed out at 5:30 pm to get my 14 miles done. I’ve never run a long run on a Saturday night, because in the past marathon training cycles I always run long on Saturday mornings. And let me tell ya, the vibe of the trail on a Saturday night is really QUIET and LONELY. I hardly saw any other runners, why? Because they either already got their long run done in the morning and were probably out enjoying dinner, or they are planning on a Sunday morning long run. I saw a couple of cyclists, but really the trail didn’t buzz with the energy it normally does. If I don’t have the stroller + my babes with me, I normally run solo with no problems. But on this long run, I kept wishing for a BRF. So as you can see, I was mentally checked out, during this run – it’s so funny how the weather and vibe of the trail can really determine the mood of my run. I started my first mile slowly to warm up with the idea that I would pick up the pace, I never did. Physically my legs felt heavy. I was definitely running on tired legs, probably because of the faster 7 miler I ran the day before. Totaling 17 miles in two days, and running back to back. miles instead of 14. When I got home, my baby was ready to breastfeed and head to bed. 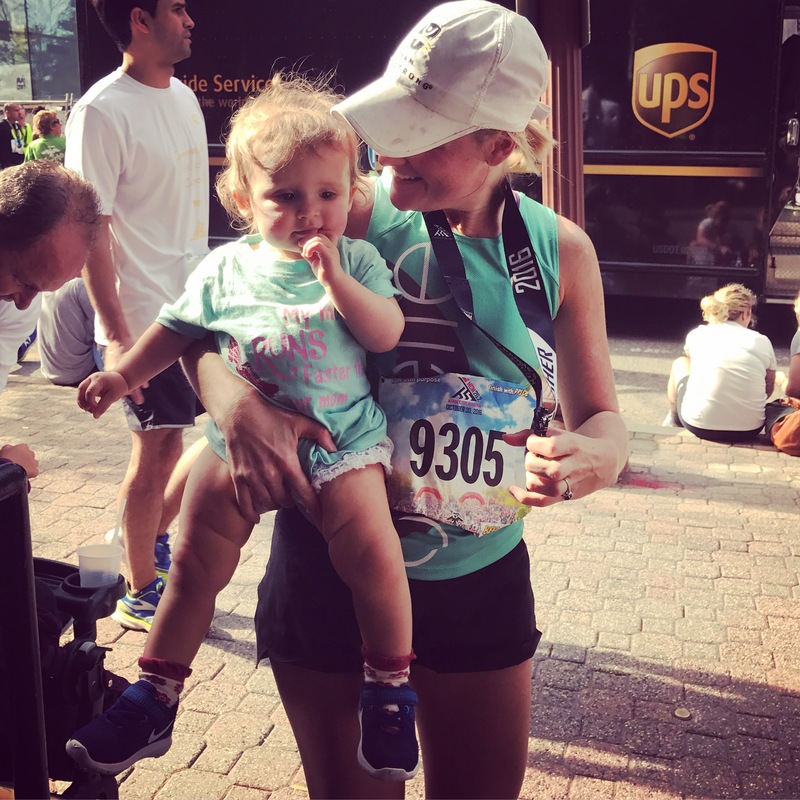 After that run, I was feeling a little discouraged… Maybe marathon training is too time consuming for me as a working mom of a toddler and 4 month old baby who is still breastfeeding?! But then I saw some really great quotes and stories from other runners on IG, that totally changed my mindset. 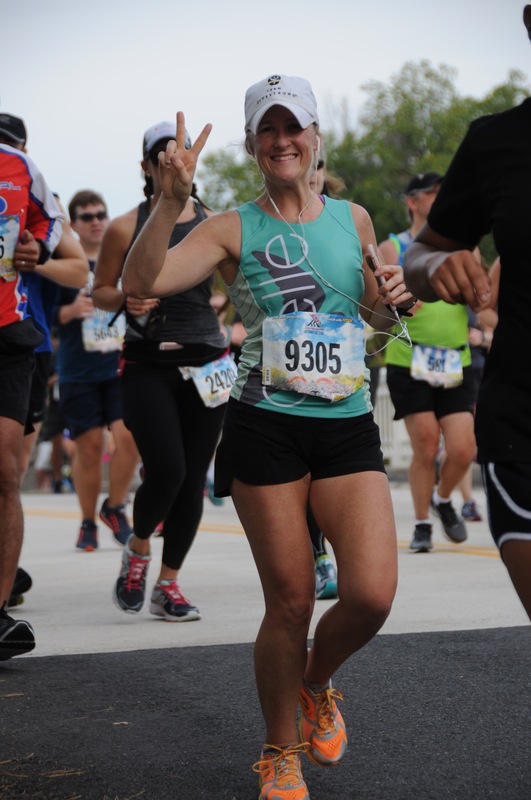 For example “Never let one run or race own your mood.” – Hollie from @fueledbylolz… or If you are tired, rest, don’t quit.” And these quotes really rang true to me. So what, I had a bad run because I ran 10 slow miles instead of 14 fast miles. 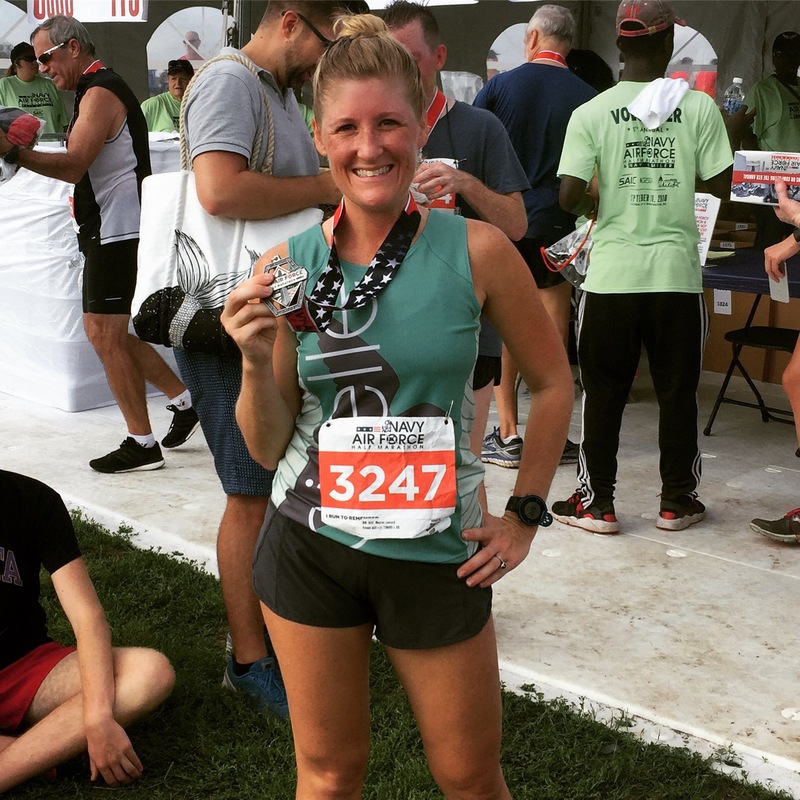 Maybe that was a hard run for me, but that doesn’t mean I’m going to have a bad marathon, and it doesn’t determine my marathon training this cycle. Also if I feel tired, I’ll rest more, and cut back to running 3 days a week, a short run, a mid distance, and a long run. I’ve done this in the past, and it has made me feel well rested and helped me avoid burn out. So with that being said… it’s time to celebrate this 10 mile long run, and the fact that I had my highest weekly mileage postpartum and hit around 30 miles for the week! It is still dark, but I feel the vibration of my phone, (my quiet alarm). I tiptoe into the bathroom while my loved ones are still dreaming. 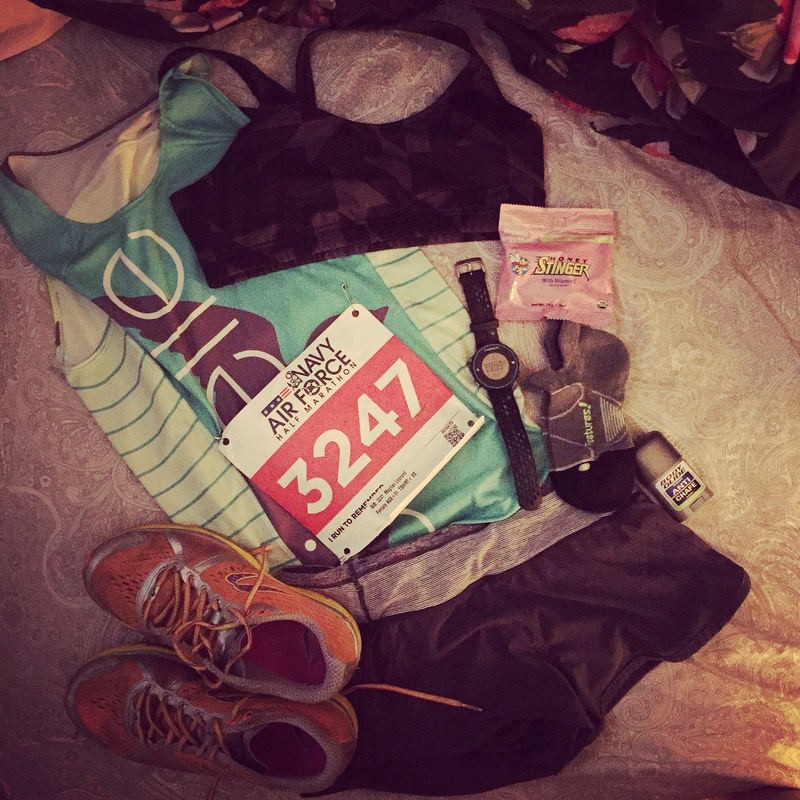 Get dressed – my race outfit was already laid out the night before. I grab an applesauce on my way out, and sneak quietly off, to the start of the race. The sun is starting to rise as I arrive. 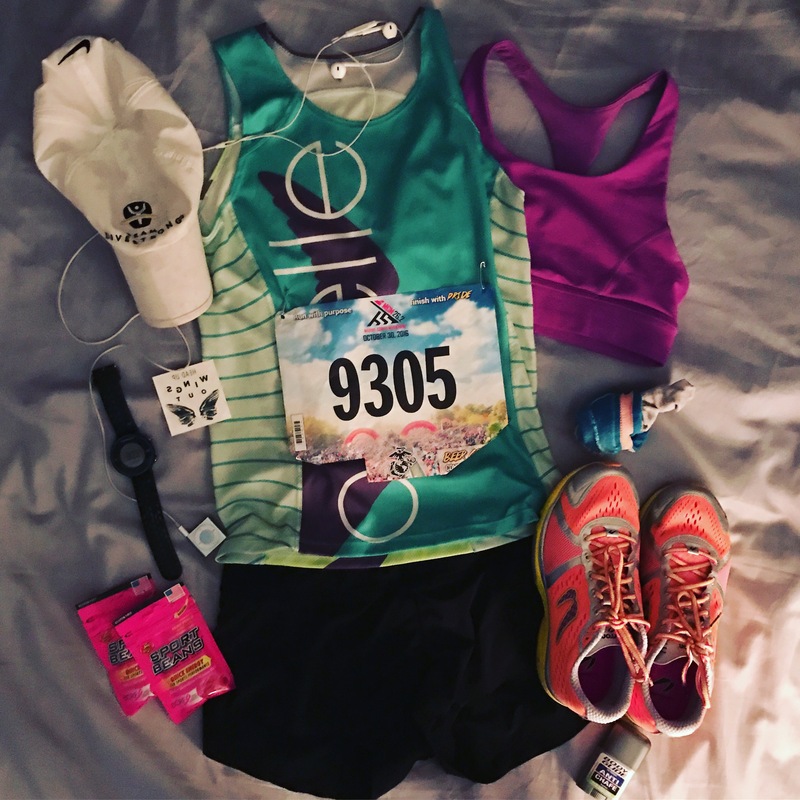 It is still pretty cold, so I wait until the very last minute to strip down out of my sweats, and check my back – my race outfit perfectly on, my bib number already pinned to my Oiselle singlet. I use body glide one last time as a precaution. Five minutes to spare, bag is checked, so I hustle to my corral. The gun goes off, and my feet leap over the start, as my garmin goes on. I hear thousands of quick feet pound the pavement, as I turn on my iTunes playlist. A canopy of green trees shade us as we go down hill. The sun shines on the river making it sparkle as we go up hill. These hills are rolling but mild, so they actually help my legs turn over faster. It is such an amazing feeling, running fast, on a beautiful spring day, with a couple thousand of other runners. Before I know it, I’m approaching Old Town, mile 8-9. Up a hill, down a hill, and a sprint to the finish. I hear my name announced as I cross the finish line. A volunteer places a finisher’s medal around my neck. The Parkway Classic is one of my favorite races, and I run it most years. However, this year 2018, I won’t be able to run it… I have two good reasons though, 1- I’ll be at my sister’s wedding. 2- I will be 4 weeks postpartum cuddling a new born, and won’t even be cleared by my doctor to exercise yet. However, supporting the running community is very important to me, so even though I won’t be in town for this one, I do plan to watch and cheer at more races from the sidelines. And just because I won’t be able to race this one, the 10 mile distance is one of my favorites to race and I know I can go faster. So as of now I’m on the look out for a different new 10 miler. I hope I find one as rejuvenating and refreshing as The Parkway Classic. And as for the Parkway Classic… I can’t wait to race you many times again in the future. What’s your favorite race distance? 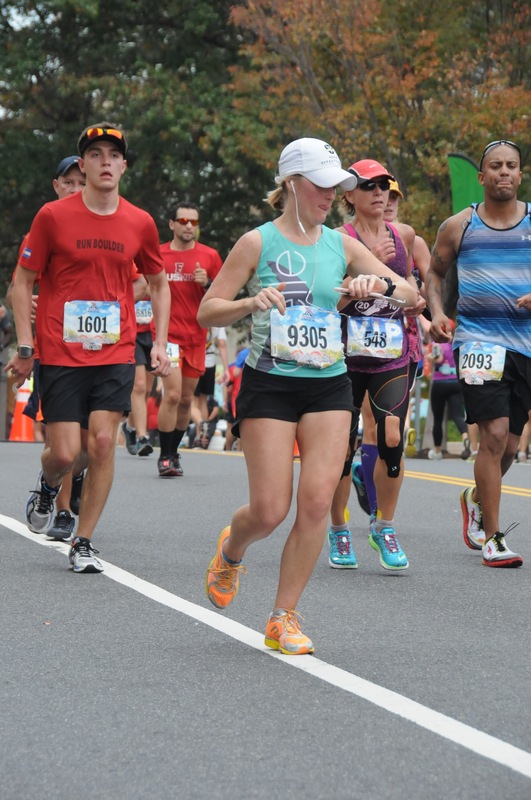 Have you ever ran the Parkway Classic? On instagram Best nine of 2017 was trending. Mine is in the far left corner, the rest are a few of my personal favorite photos of the year. After looking through my photos and review my yearly stats on Strava. I discovered something very cool about 2017. 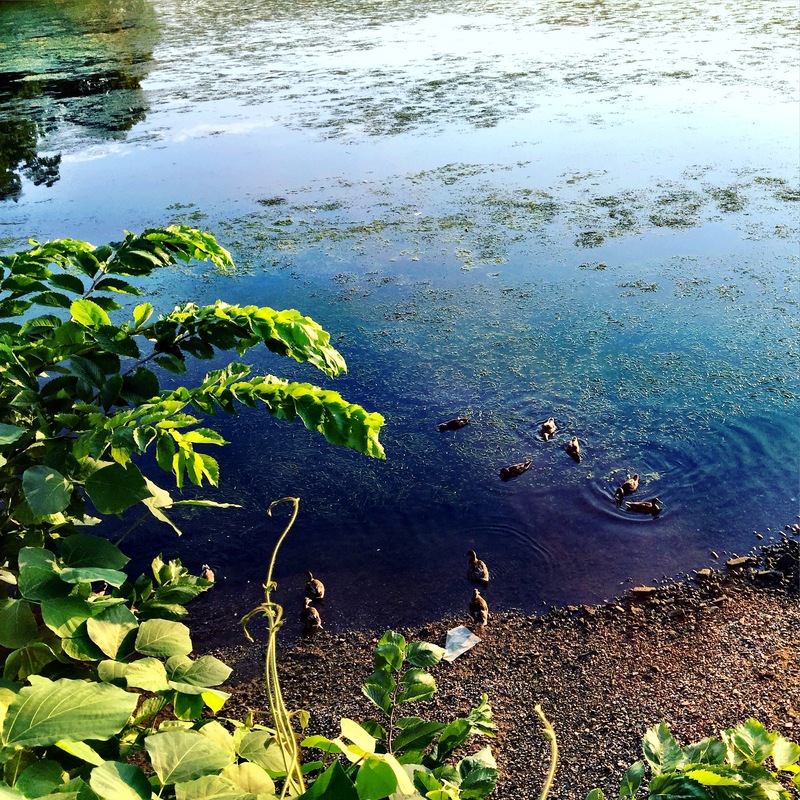 In 2017, I spent time outside everyday… running and mothering. 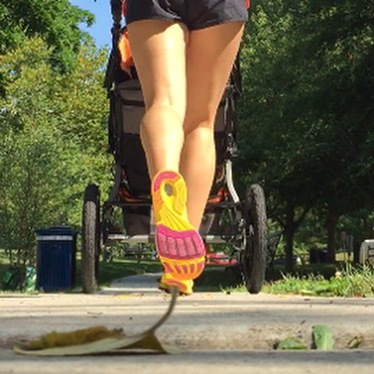 I ran solo miles, stroller miles, and pregnancy miles. I marched for what I believe in. I hiked to see waterfalls. I jumped waves, and felt sand between my toes with my loves. 2017 has taught me that you don’t have to travel far or experience something huge and impressive… in order to be challenged, learn new lessons, feel love, and find beauty. I hope you can reflect on 2017 in a positive light, and create more beauty in 2018. I’m excited to say, I am runnning a 5k this weekend!! I honestly do not remember the last time I signed up for a 5k. I’m an endurance athlete, long distance runner, so I do not race the 5k often. 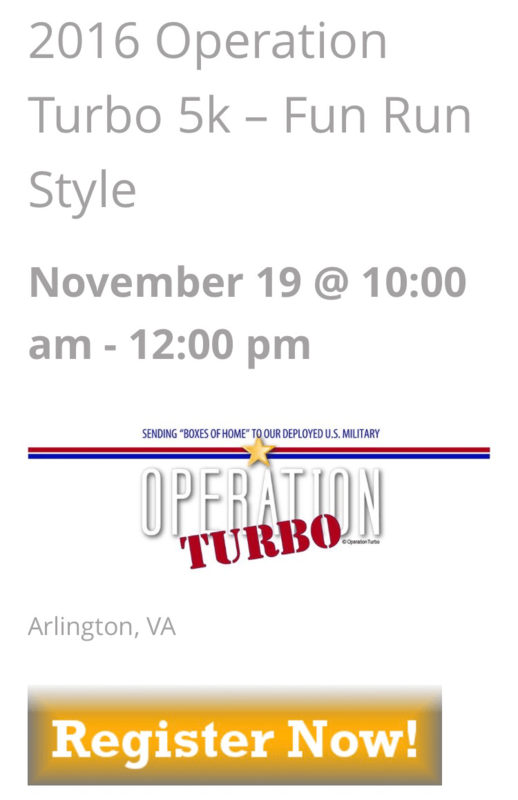 However, a friend of mine, runs an organization called Operation Turbo, and is putting on a 5k race this weekend. So I decided to show my support by signing up. If anyone is in the DC area and is interested in running this race on Saturday, sign up here. If you are not in the area, you can always run the virtual 5k. Have you ever run a virtual race!? 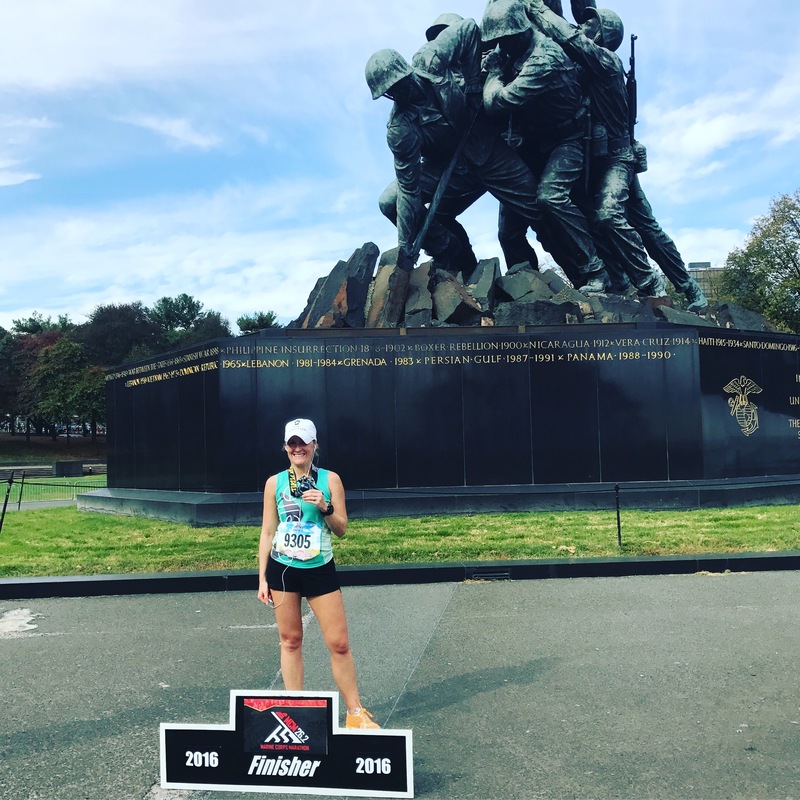 In honor, of the Marine Corps Birthday, (that was on Thursday), and Veterans Day Weekend, I thought it would be a perfect time to post my race recap on running the 2016 Marine Corps Marathon. 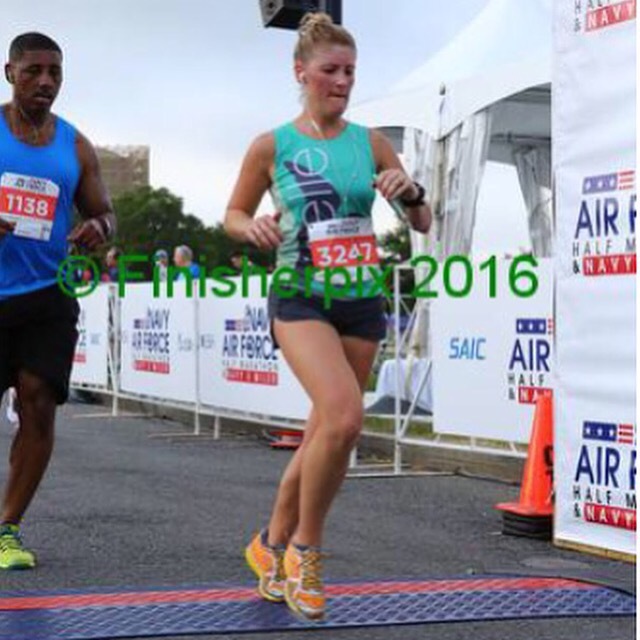 On Sunday, October 30th, 2016, I ran my fourth Marine Corps Marathon. Although, it was my fourth MCM- this marathon was my first full marathon I ran, 14 months after having Zoe, and my fourth postpartum race. 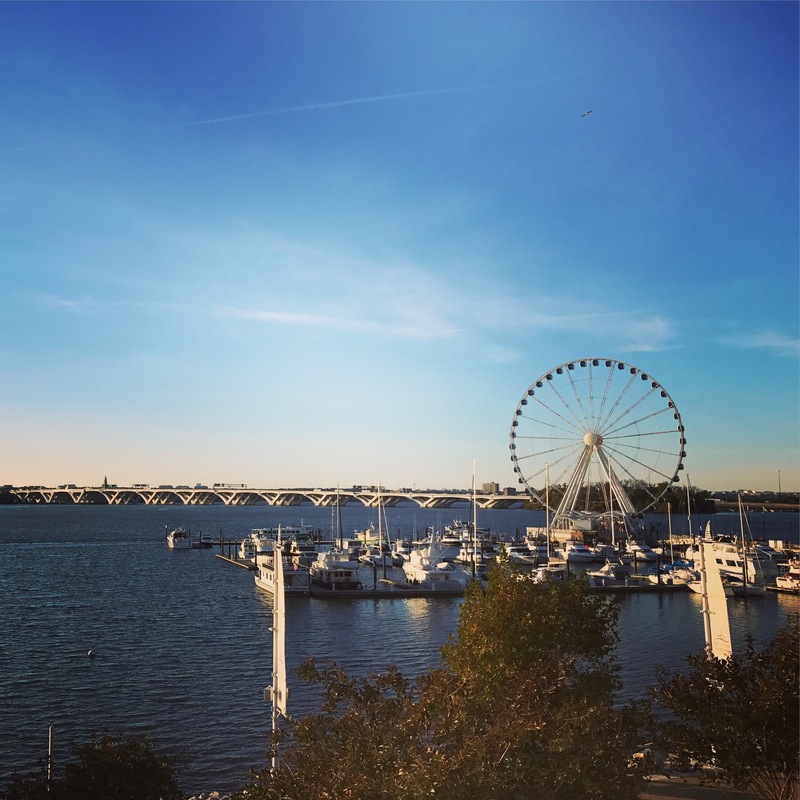 The Expo was held at the Gaylord Resort in National Harbor. At first, I was a little annoyed that they moved the Expo to Maryland instead of having it in DC. There is no metro located on National Harbor, so I feared there would be a lot of traffic and no parking. Turns out it was perfect. 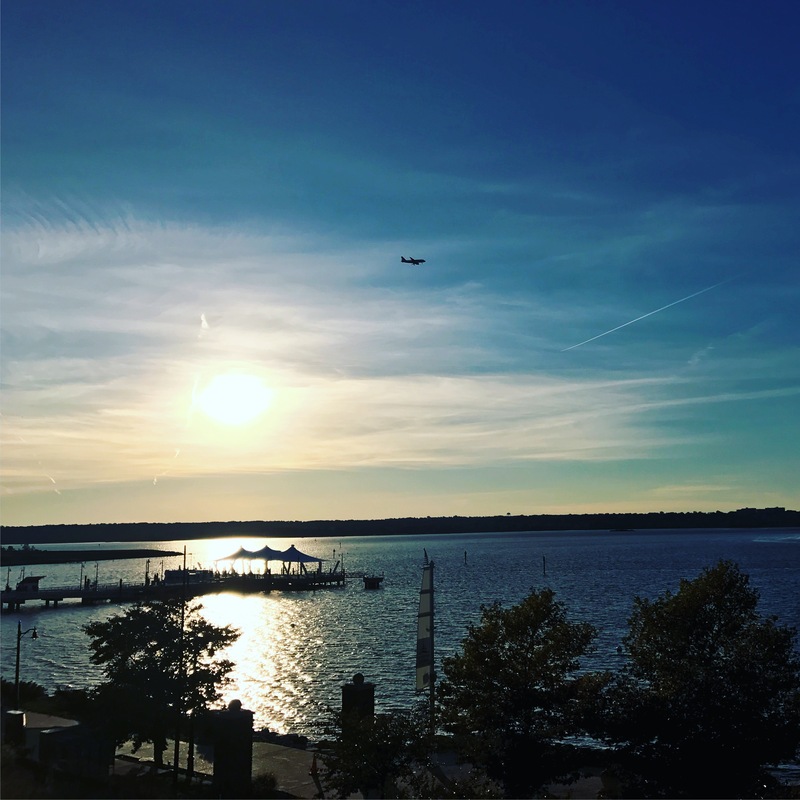 Not to much traffic, plenty of parking, and beautiful views of the Potomac river. We normally see these view from across the river, from the VA side. The Expo was held on both Friday and Saturday. I went on Friday afternoon hoping it wouldn’t be to busy. There were no lines getting in and no lines to get bibs. However, there was a line to the check out to get MCM gear, and because I had my 14 month old with me, there was no way I could wait in it. I ended up just getting my bib and skipping the MCM gear area. (I’ll purchase some gear later online. I wore my Oiselle sweatshirt to the Expo, talk about flystlye. This sweatshirt is so warm, cozy, and stylish. 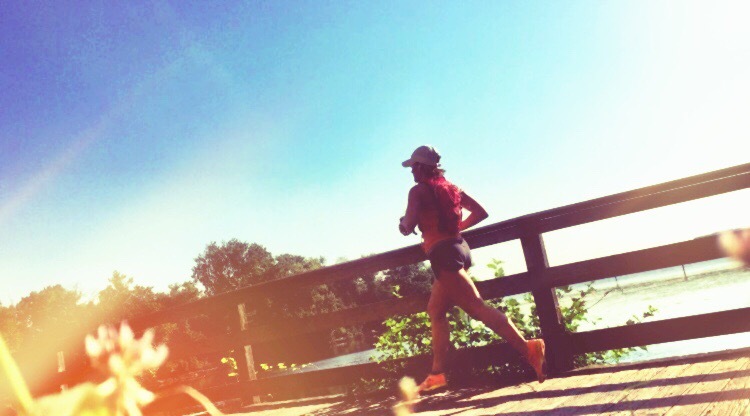 Some runners hate expos and avoid them if they can. I, on the other hand, love the Expo. The Expo always gets me pumped! Plus, who doesn’t want to shop for more running stuff?! I ended up shopping around, and purchased a running skirt from Mana Threads. I bought a sports bra and tank top from them at the Cherry Blossom Ten Miler Expo, and I was excited to see them again. I’ve never run in a skirt before, and honestly, never thought I would. I actually use to “roll my eyes” at runners who wore skirts. But I’m at the point that I’ve been running for 8-10 years now, and it can be difficult to find something new and different. So I’m going to give the skirt a try. Might as well… I might love it. I also checked out HOKA shoes. The guy was very knowledgeable. I’m pretty loyal to Newton, but want another type of shoe in my shoe rotation. So in the future I might give HOKA a try. Every long run I ran this summer was in record breaking heat conditions. 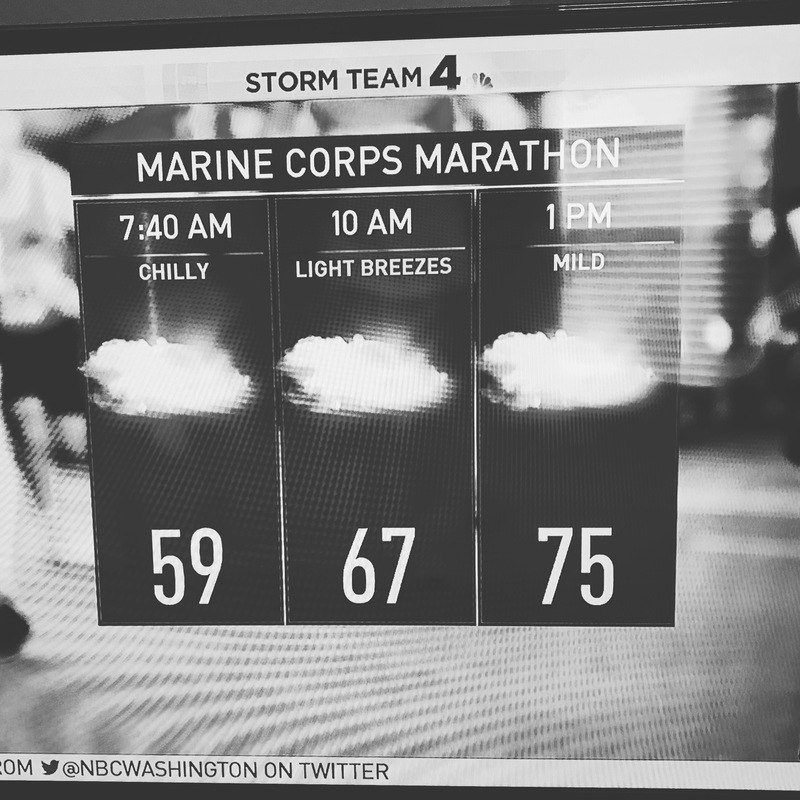 Just my luck… the weather man was predicting unusually warm summer like conditions on race day. In my running groups, everyone was worried about the heat. 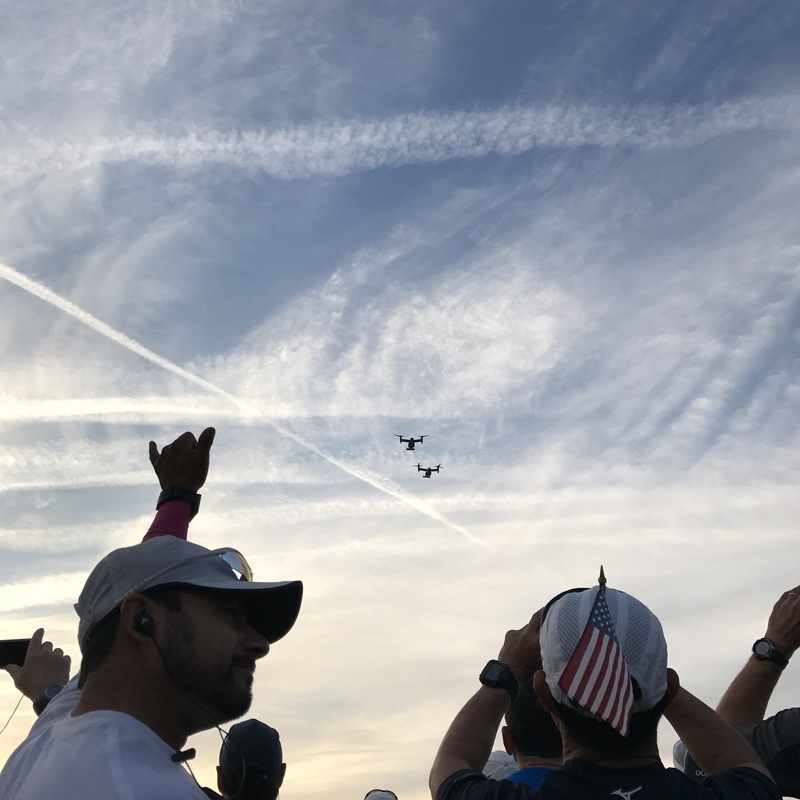 We even received an email from the Marine Corps Marathon organizers, saying – to slow down race pace, and to hydrate and dress for hot conditions. Every time I run MCM the weather is perfect. 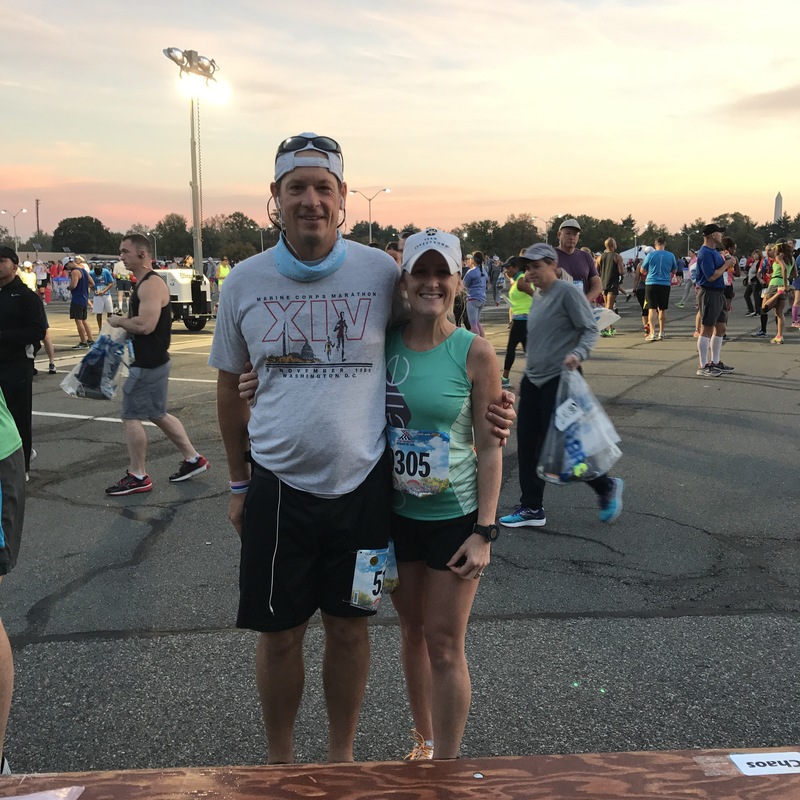 I checked back on my blog post from a couple of years ago, when I ran my 3rd MCM and it was 30 degrees cooler that day. I don’t do well in the heat, and I also was pretty congested because of a cold. However, I trained in a heat wave of a summer in 80-90 degree record breaking weather, so I wasn’t too worried. I also wasn’t going to put my mind in a negative state. Positive vibes only. I was just going to run my best and see what I could do. I was confident. 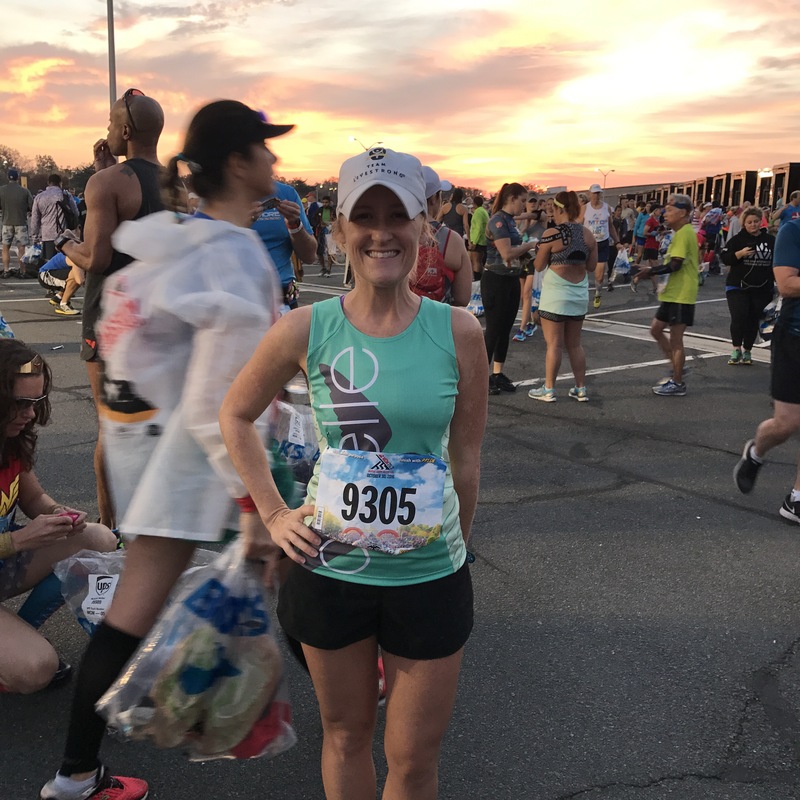 I put in all the miles during training, and I knew once I got around the energy of the other runners, my excitement would keep me going strong. A lot of runners chose to wear their hydration packs on race day. I thought about it, but I really didn’t want the extra load. So my game plan was to rely on water stations, hoping they wouldn’t run out. I also planned on starting at 7:55, when the gun went off. 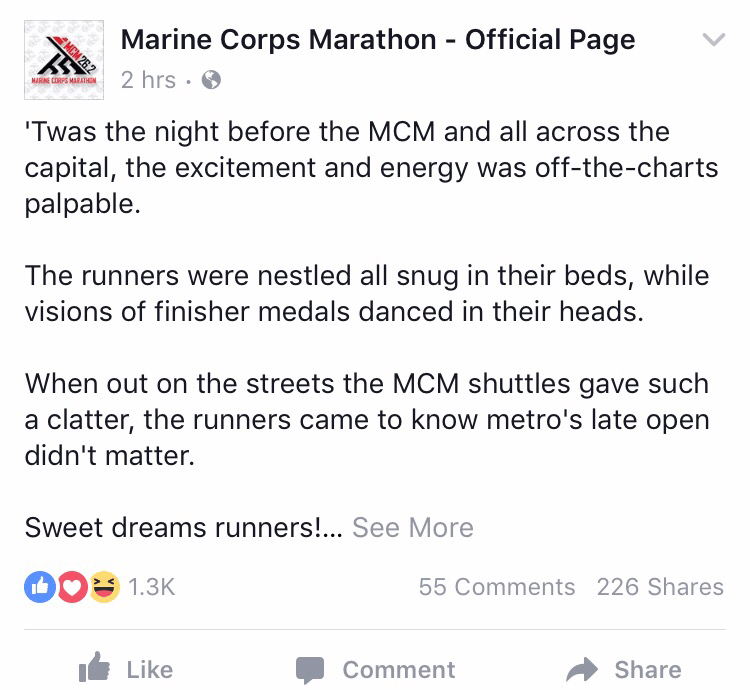 Because the metro wasn’t opening early for us, due to safe tracking, MCM organizers were leaving the start open for a full additional hour. This meant late runners could cross the start line as late as 8:55. But this also meant that these late runners would cross the finish line later in the day in hotter conditions. 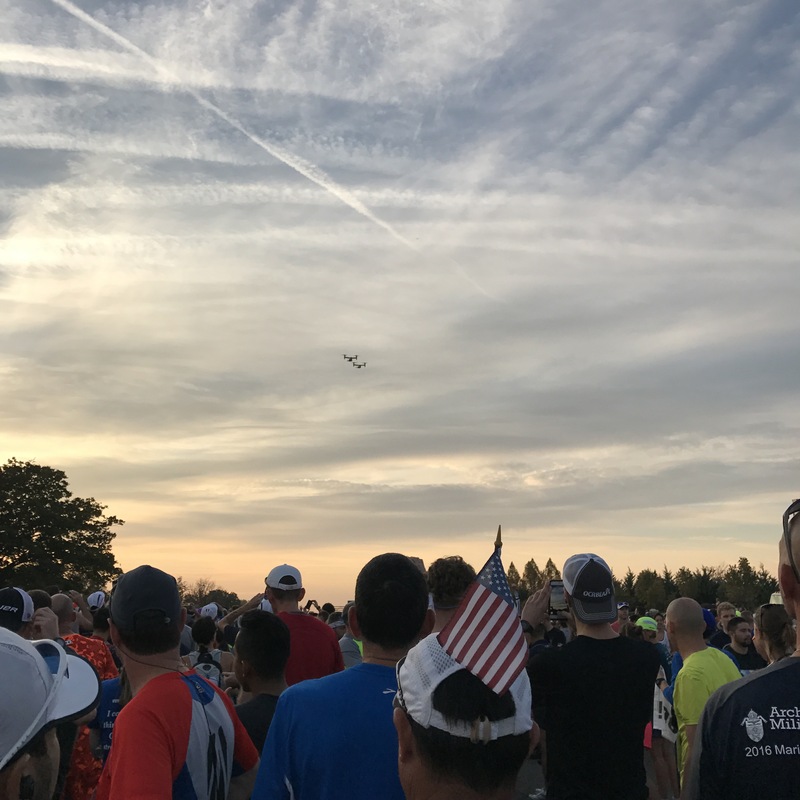 My game plan, get there early, start my race when the gun goes off, run my race during the gorgeous morning, cooler temperature, and finish my race before the afternoon heat. Saturday night, I spent some time trying to decide what running outfit to wear on race day. 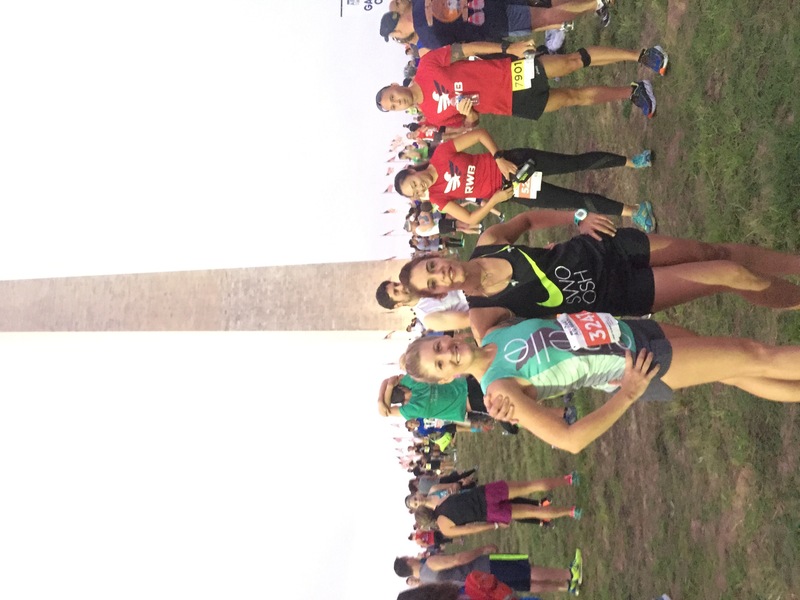 I decided on my oiselle singlet, and I’m so glad I did! I stayed comfortable and cool up until mile 24. And wearing the oiselle singlet helped my oiselle teammates see me easier. I really love running for oiselle. I joined the team after having Zoe, and the support has been amazing. I also carb-loaded for two days straight with spaghetti and sauce that I made homemade. I was as ready as I could be. So it was time to just try to get a good night sleep. But before shutting my eyes, I checked social media to support other runners and gain some inspiration. 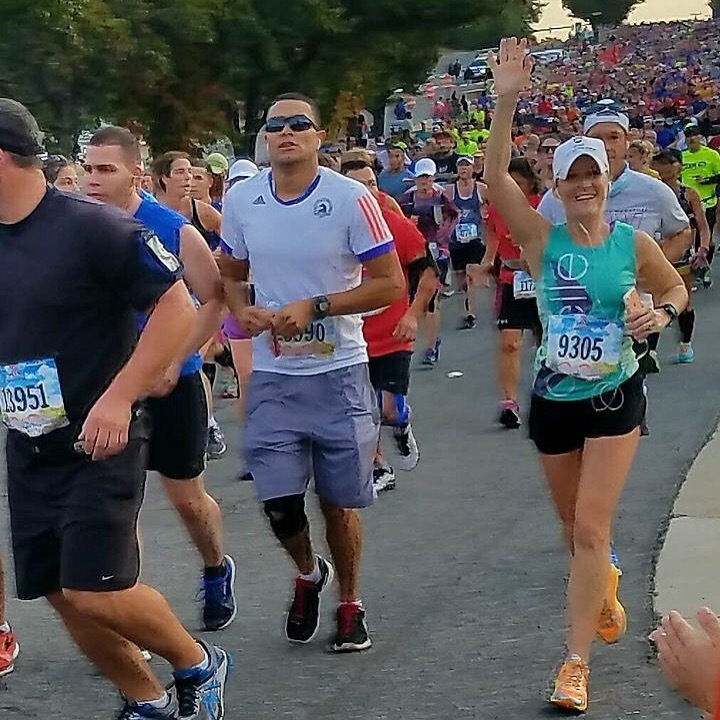 This is what I found on the Marine Corps Marathon facebook page. I laughed when I read it! 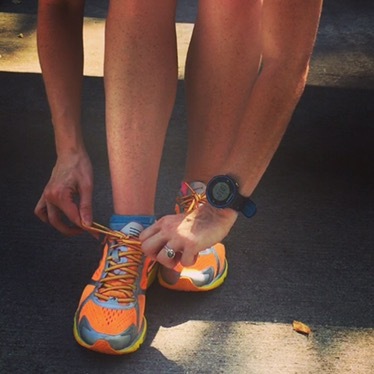 Because no one sleeps well before a marathon. My alarm went off at 5:20 am. I tiptoed through my dark house and got dressed and ready. Grabbed my iPod shuffle (which I didn’t use, I just had it as a back up) and Garmin. By 6:00 am, I was off to my mom’s house. Because the metro wasn’t working- I parked my car at my mom’s house, and she dropped me off in Pentagon City. A ton of other runners flooded Pentagon City, so I just followed the crowd walking over to the start, eating my pb&j. Like always, the Marines greeted us, and welcomed us with excited faces. They checked our bags, getting us through security quickly. 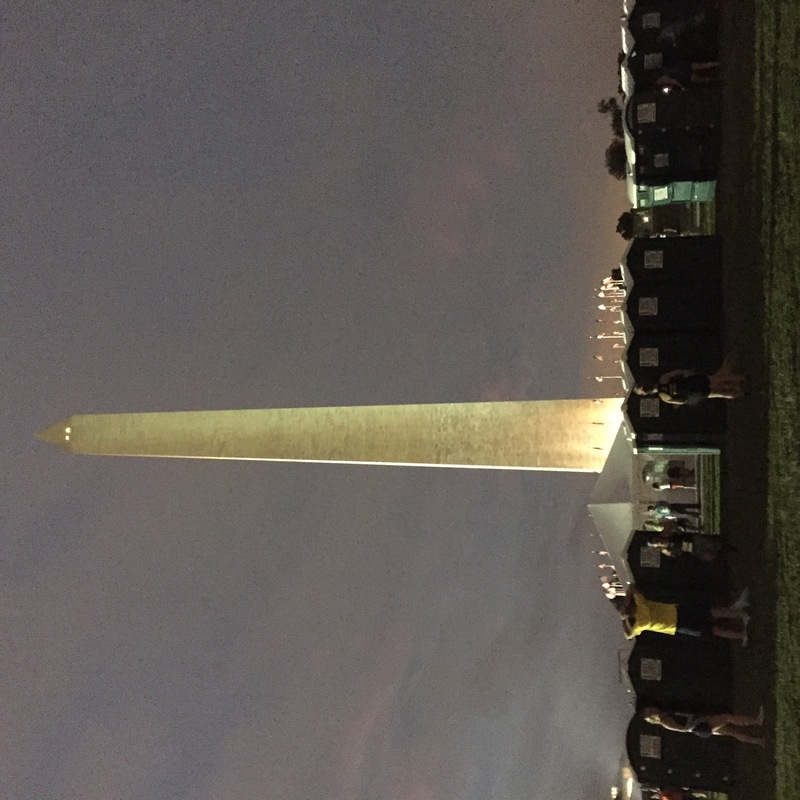 I was there pretty early, and because I had time, I decided to hit up the porta potty, making conversation with the guy in front of me. It was his first time running MCM, so I let him ask me all of his nervous questions. Unlike years in the past, I wasn’t shivering. It was close to 60 degrees already at 6:30 am. I was in long pants and my long sleeve zip up MCM shirt from the previous year. It was time to strip down into my race clothes and drop my long sleeves at baggage claim. When I was at baggage claim the sun began to rise. My dad was also running the marathon. I received a text message from my saying he was on Memorial Bridge running to the start. He asked for me to wait for him so we could get a picture together. My dad and I walked down to the start line at 7:30ish. 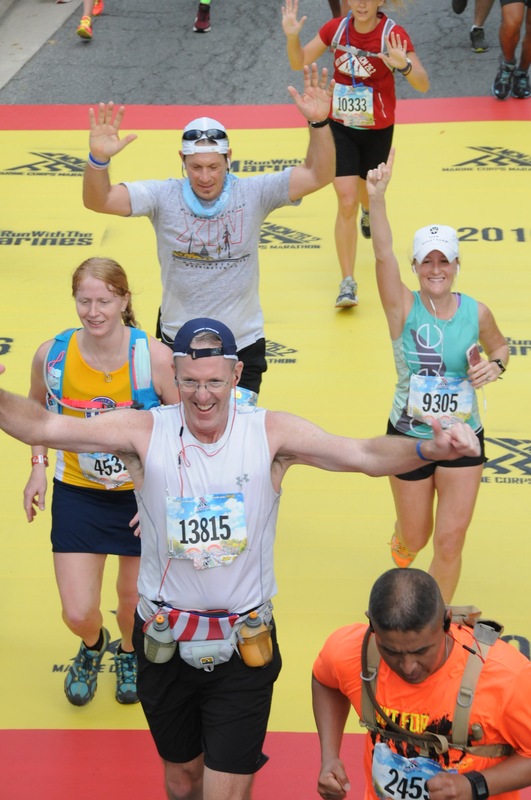 We squeezed our way up to the 4:10 and 4:15 corral – standing with a view of the 4:15 pacer. 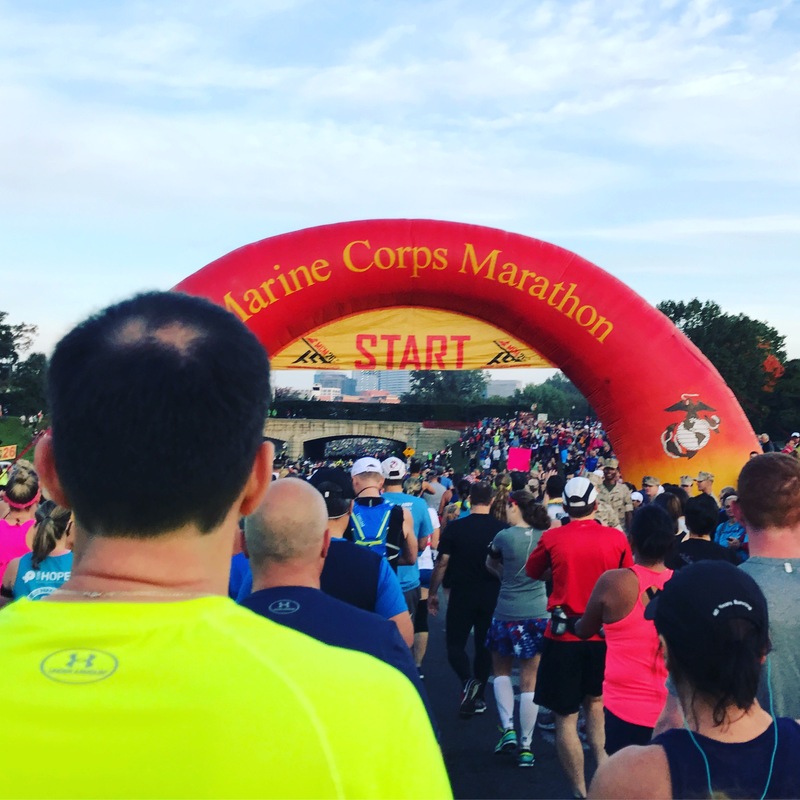 The Marine Corps Marathon is The People’s Marathon – which means they do not assign corrals, instead they allow the runners to choose a corral. 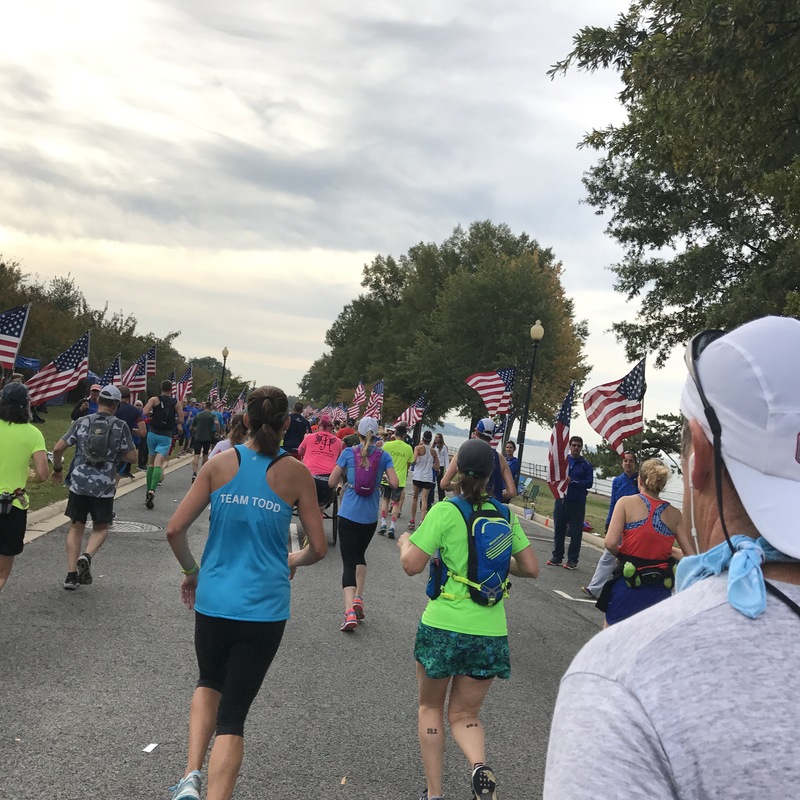 Because Marine Corps Marathon has 30,000 runners, the first three miles can be crowded and slow, so I always try to stand in the corral ahead of my ideal finishing time. My goal finishing time for this race was 4:15. Maybe I could run it faster, because I ran my last half marathon, a month before, in 1:53, and felt good! But I finished my last full marathon in 4:19, (2 years ago) so I would be happy running that, or a faster PR. So standing in the 4:10-4:15 corral seemed to be a good place to start. The actual start didn’t seem as exciting as years past. It actually didn’t seem crowded at all. But maybe that’s because of the option of starting later. But in the years past, people are normally packed in, clothes going everywhere. One year a beach ball was going above our heads. Everyone cheering! 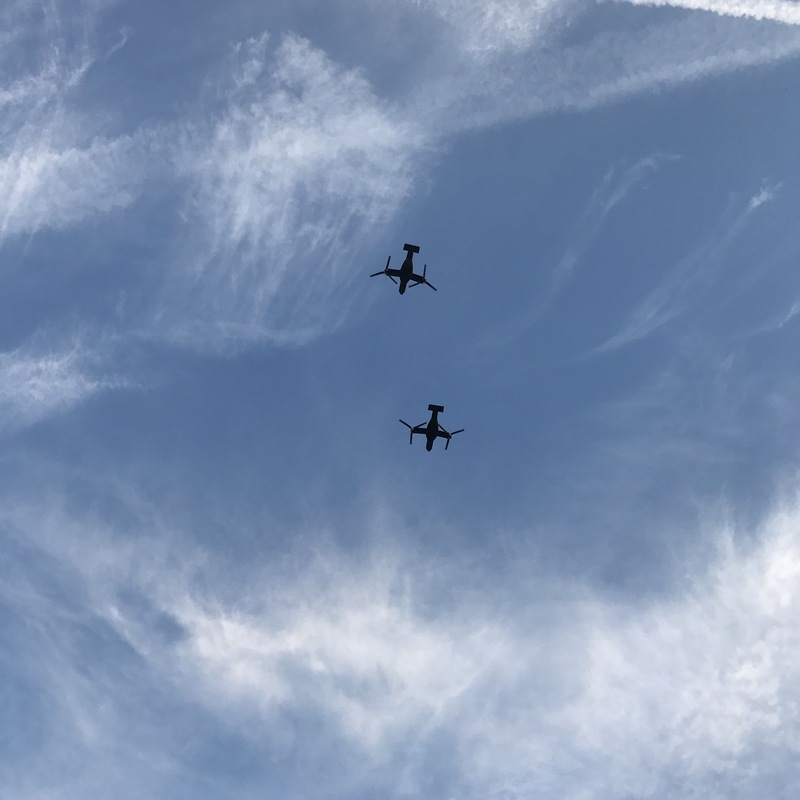 The real excitement happened when they flew military planes over our heads. We ran down 110, up through Rosslyn, up Lee Highway. My husband, daughter, and Mom were waiting for me at mile 2-3ish on Lee Highway. It was easy to spot them because my little Zoe was on my husband’s shoulders. It was so fun seeing them, especially Zoe!! She was excited seeing her Grandpa aka Poppy. My dad showed everyone his 1989 MCM race shirt. As I looked at my watch, my dad made observation that we climbed that hill pretty fast. We were on our way to Spout Run. We ran through Spout Run during miles 3-5. This is one of my favorite parts of the marathon because it is by far the prettiest part of the race. Trees shaded us while we ran up and down slight rolling hills, as we approached the Key Bridge. My Dad and I were still running side by side. Over the Key Bridge we went, leaving Virginia and entering D.C. I love running over the Key Bridge. And Georgetown is usually a very exciting spot during the race because the spectator support is so huge and energized. There is normally a band playing from Georgetown University, and a group from Lululemon cheering while sipping mimosas. However, this year I didn’t see any of that and to my surprise it seemed like a ghost town. But, we continued on, down Wisconsin we went, and up to Rock Creek park we headed. My dad and I were making great timing! Usually, Rock Creek Park is up one huge hill and then a crowded turn around, then a down hill. But this year they cut it short and it wasn’t crowded at all. My dad and I both looked at each other with a smile, when we realized we didn’t have to run the hill. Mile 11 is called the Blue Mile. This mile is lined with photos of fallen soldiers. It was very emotional. Many people stopped in front of their fallen solider to cry, or get a picture. American flags lined the end of the mile to uplift us. Haines Point is normally the boring part, but we got through it – still feeling really strong and on pace. During one of the water startions, my dad grabbed a GU (energy gel) and I lost him. But my cell phone rang, and it was him, and he was coming up on the left hand side. Off we went to the National Mall. Dad shouted we were over half way through. At mile 15, I told my dad we only had 2 miles until mile 17. Mile 17 is a significant mile in the marathon, because you only have 9 miles left which means you enter single digits. We were both running on pace, but it was then that my dad told me to go on ahead, if I thought I was going to break 4 hours. I didn’t know if I could do that, but I was going to try. So I picked up the pace on the National Mall and headed to the 14th street bridge. It was awesome that my dad and I ran 15 miles together. I left the National Mall and was heading on to the 14th street bridge. The bridge is normally mile 20, but because of the late start, and the eagerness to open DC streets, we had to leave the city on time. So they made the bridge mile 18 instead of the normal mile 20. The goal to the bridge is to, “Beat the Bridge.” Many people hit the wall here and begin to walk. It can feel really hot, or super windy. But I actually always love the bridge. And I never walk. Once I was on the bridge, still running, I texted my husband to let him know I was on the bridge heading to Crystal City. He was shocked I was calling so early, ahead of schedule. He was on his way to meet me in Crystal City. I also knew my Oiselle teammates had a cheer station at mile 21. So I was keeping a look out. Mean while, I was still on pace and feeling strong. I ran through Crystal City, eyes wide, looking for people I knew. Around mile 22, I saw my husband, mom, and baby, again, waiting to cheer me on. Zoe was so cute having fun watching all the runners, smiling big when she saw me. I got some pictures and I told them I was feeling good and making great timing! 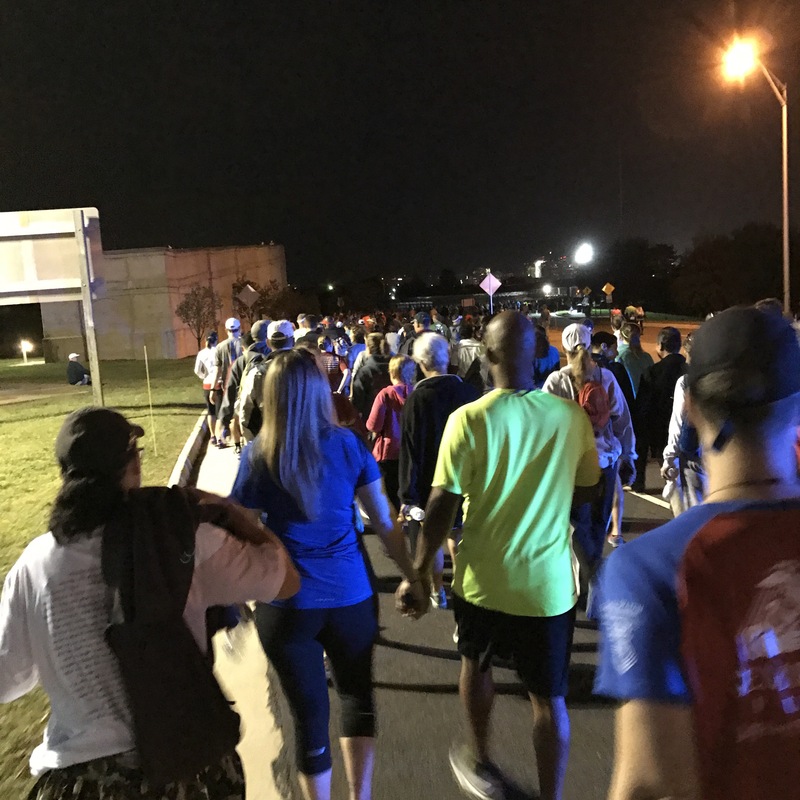 After leaving my family, letting them know I would see them at the finish, I kept on pace. I started looking for the mile markers. It wasn’t until mile 24, that I started to feel really hot. But at mile 24, I felt a tap on my shoulder. It ended up being one of my runner friend, Raj Running Yogi! It was such a fun surprise seeing him. I hope I was friendly! At mile 24, looping around the pentagon, I was just trying to stay focused and look for my street signs, that always helps me get to the finish. I could see the finish line in the distance. Then the street signs appeared. I told myself just get to the Memorial Bridge street sign. Next thing I realize, I’m running passed it and seeing the Key Bridge street sign. Passing the Key Bridge sign, I made a left heading to the Iwo Jima memorial, uphill to the finish. Although, the finish line was moved to the right this year, it felt amazing crossing it! This Marine gave me my finishing medal! Took a photo near the Iwo Jima memorial. I met up with my family. And got to show my daughter Zoe my finishing medal. All of our hard training paid off! 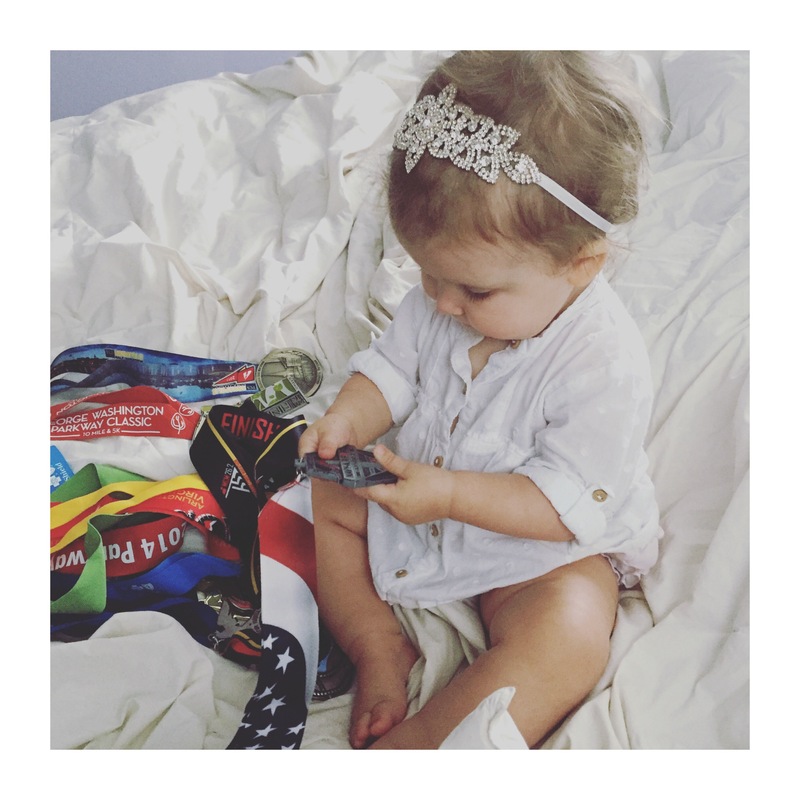 It felt amazing showing my daughter my medal. After the race was over, my husband, daughter and I enjoyed bunch at Lyon Hall. Although, it was hot running conditions, and a “difficult” course, I felt great most of the race. I ended up finishing in 4:17:01, which was a little over a 2 minute PR. 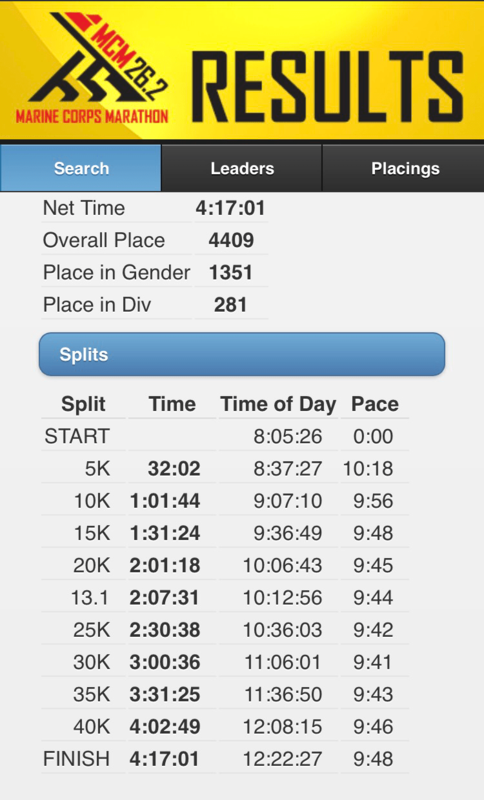 I am very happy with this time, and over all had a very successful marathon. The most fun thing about this race was running the first 15 miles with my dad. I am very impressed with how fit he is! I’m also most proud of the fact that I trained for this race with my daughter by my side. 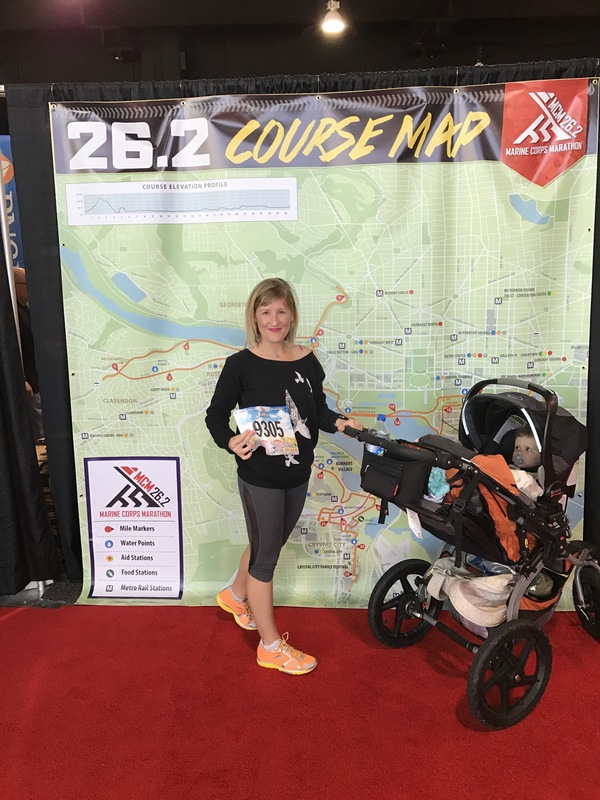 Yes, my identity has changed now that I am a mother, but it has not changed my passion for running and living a healthy lifestyle. It is very important to me to show and teach my daughter- that with passion, dedication, and hard work, anything is possible. I will be running a Turkey Trot this thanksgiving with Zoe in the stroller. But as of that, I’m still trying to decide which marathon I want to run next. In the mean time, I’m hitting the weight room again consistently. Its time to get stronger again. Thank you to everyone who inspired and supported me through this marathon training season, and the marathon. This includes MRTT, Oiselle, and everyone that followed along on IG, FB, Strava, and this blog. 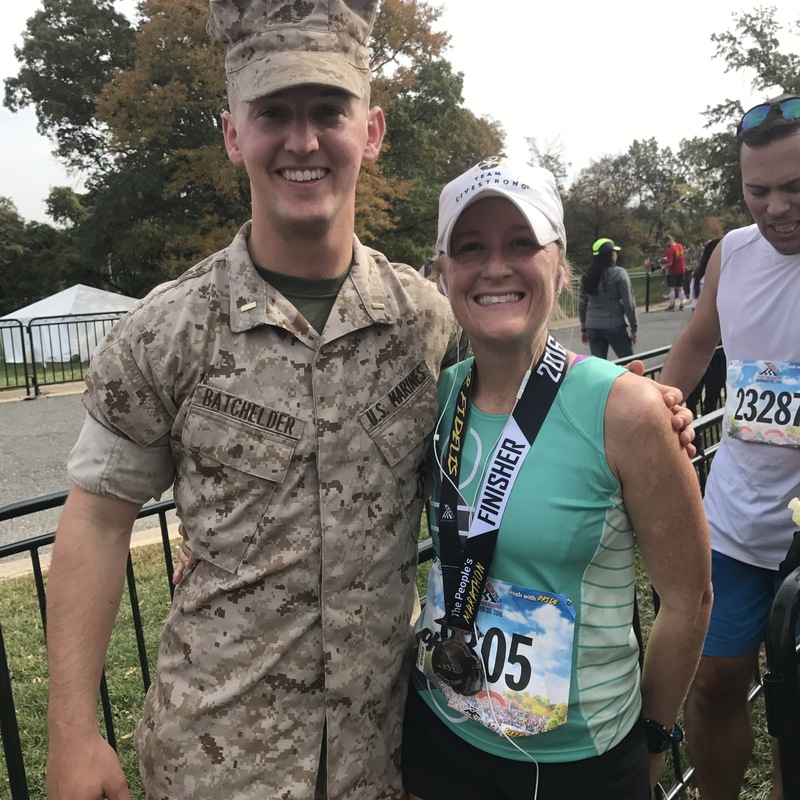 Also I want to give a special thank you to the Marines, race organizers, volunteers, and race spectator support for another amazing Marine Corps Marathon experience. It’s so amazing to be a part of something this big!! And the running community is incredible! Now let’s set new goals, and run all the miles! 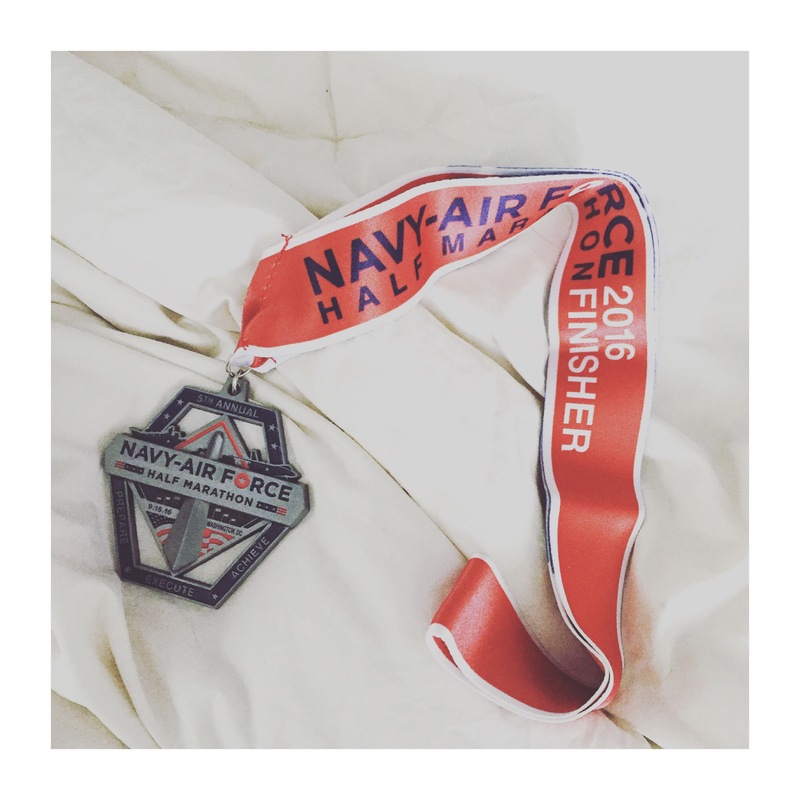 Race Recap: Navy Air Force Half Marathon – 3rd postpartum race. Friday, 9/16/16: Through the Nats Stadium, I headed to the expo, as my baby napped, while I pushed her in our BOB running stroller. 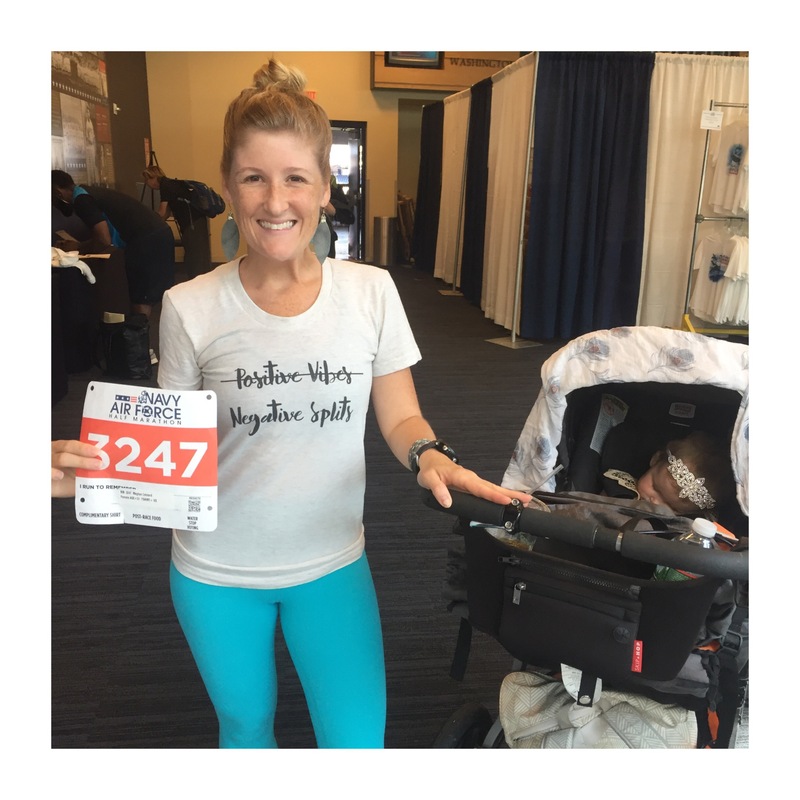 She continued to sleep peacefully as I picked up my bib for my third postpartum race. Now, here I am doing exactly that. Saturday, 9/17/16: As always, I preformed my night before race ritual of laying out my race clothes. 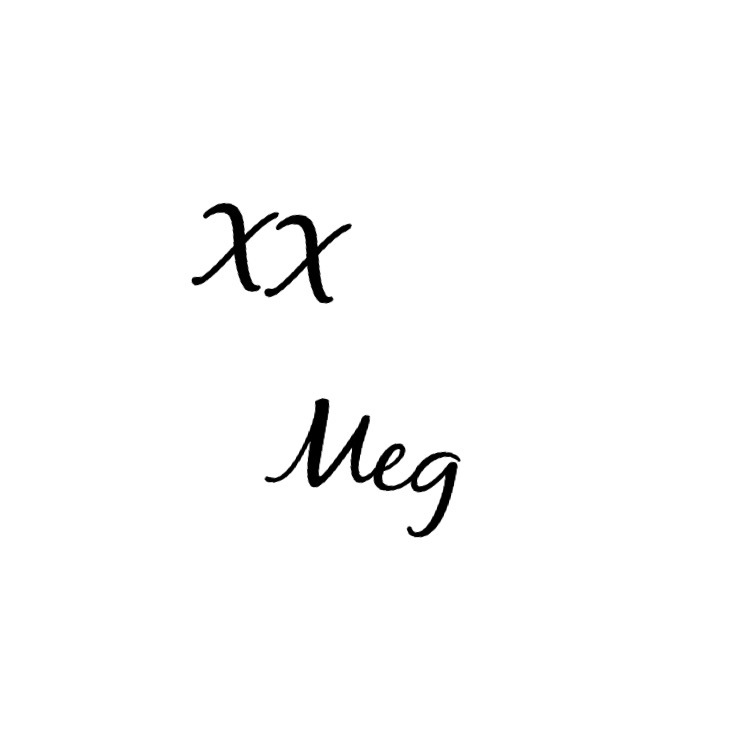 Hashtagging Flat mama, flat Meg. (Which means laying out your race clothes without you wearing them, meaning they are a flat version of you.) Side note: I was really excited that I would be wearing my oiselle singlet and sports bra. Sunday, 9/18/16: It was still dark outside, but I tiptoed around the house at 5:00am to get dressed and ready. The metro is not opening early for the race because of safe tracking, so I drove to L’s house and we took a cab from there. We arrived to the start as the sun came up. 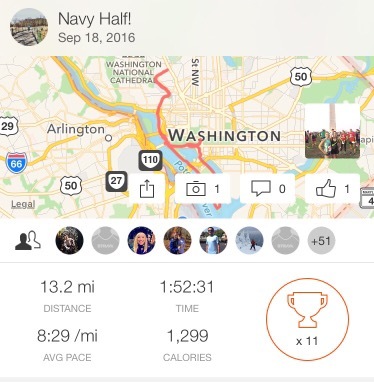 Most people that I know who are also in the middle of training for the Marine Corps Marathon used this race as a training run. They practiced running marathon pace. At the start, I’m still trying to decide if I want to do the same, or race. At one point, we headed up Rock Creek Park. It’s a bit hilly, but I always like the mix up. While we were heading up, the pro/elite runners were sprinting down. It was really inspiring seeing them, including a female pro/elite runner wearing a oiselle singlet. All of a sudden I was approaching mile ten. I couldn’t believe I only had 3.1 miles to go. The last 3.1 miles went well and I sprinted across the finish line in 1:53:54. This race was not a PR for me, but I was really happy I ran it in under 2 hours. 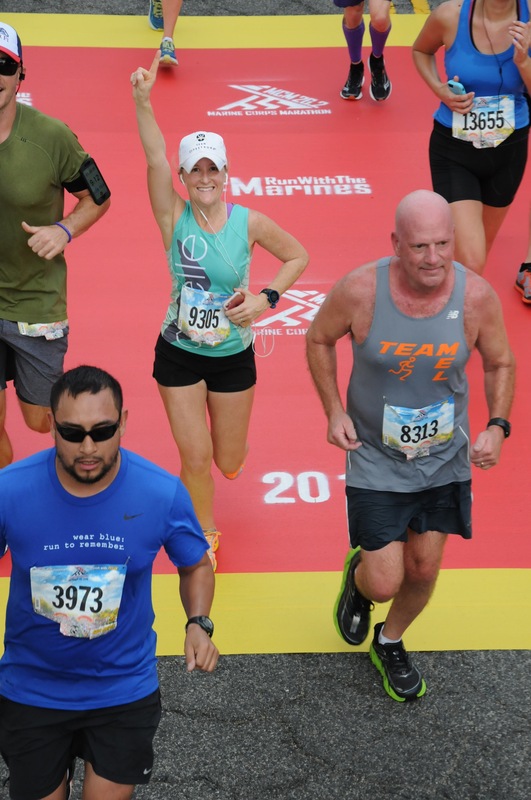 After all the marathon training in the heat wave of a summer, this race brought my confidence back. My favorite thing about the race was seeing so many Oiselle Volee team members along the course and cheering on the side lines. It’s so cool to have such awesome support and meet some of my team mates for the first time. I also loved how the race directors automatically texted your split times through out the race. This kept my pace on point. Seeing the pro/elite runner through out the race made me pumped. The race was one of the smaller races in the area, which was a nice change. It never felt over crowded. Rock creek park hills was a nice switch up from the otherwise flat city course. PASSION, DEDICATION, and the idea that anything is POSSIBLE if you work hard. So that’s all for now. Next up, Marine Corps Marathon!! Let’s Run all the MILES!! 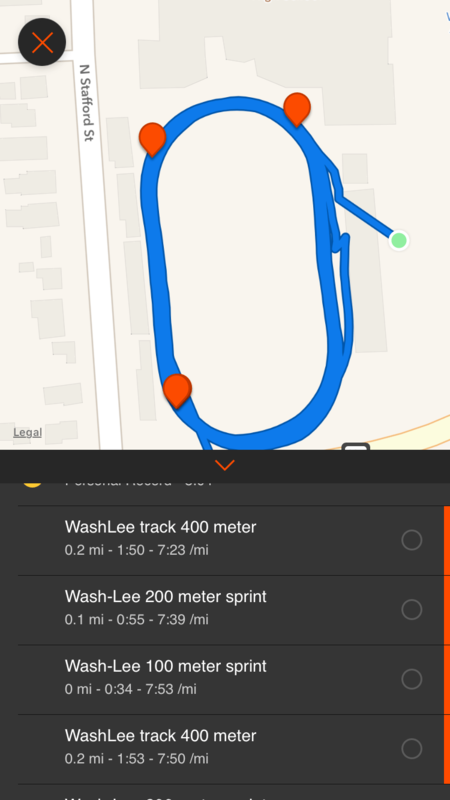 Run the Track to enhance your Marathon training! 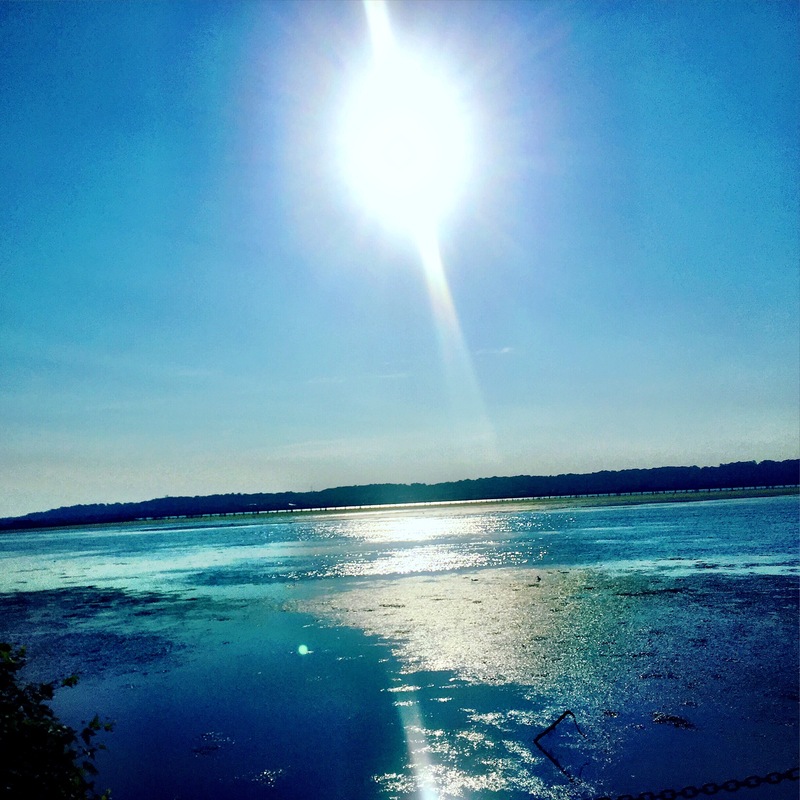 When I’m running, I’m running the trail, in search for an amazing view. Or you can find me running my city’s bridges and streets, looping around the monuments. I’m rarely on the track, and I’m never on the treadmill. When it comes to the treadmill, it makes me cringe. I don’t even like seeing pictures of people running on them, on social media. The only time, you’ll ever catch me on a treadmill is if I’m taking a month off of running to focus on building muscle. During that phase, I may use a treadmill to do a HIIT session. But other than that, you’ll never see me running on one. However, all of this long distance running, all of this marathon training, (where my focus is currently on pacing, and endurance), has actually made me crave some speed. So I went to the track today, and because running more track workouts is a goal of mine, I plan to be there at least once a week. One – the vibe: I know I’m there to run fast, and get some speed work done. There are a lot of other great runners with the same exact intentions, which helps motivate me. Two- I can run there safely at anytime. This is a place I can get a run or workout in even after the sun sets. There is alway people there and the lights are always on at night. I love being outside, and I find the most success with my workouts when I use minimal equipment. I am old school when it comes to my workouts, I really don’t need a fancy workout class to see results. Today, I did mile repeats. Mile repeats is exactly that. I ran 1 mile as fast as I could, and then did a half mile recovery. Then I repeated this 3 times. It is suggested for marathon training to actually run 5x (1 mile sprint, 1/2 mile recover.) But this was the first time I’ve been to the track in a while, for speed work, so I stuck with the lower mileage drill. I plan on building up to doing it 5x. For more information on Mile Repeats. Check out this video by Bart Yasso. I highly suggest getting to the TRACK. However, if a track is not available, you can do this drill outside in your neighborhood or trail. Run a mile as fast as you can, run a half mile recovery. Repeat. And although, I personally hate the idea, you can do this drill on the treadmill. Just remember that completing this drill on the treadmill is not quite equivalent to an outdoor drill, and it is not an accurate measurement of your speed. Because of the momentum of the moving treadmill, it actually makes this drill easier and makes you run faster. So if you want to get the most out of this drill, hit up your local track. But once I started running, I felt good. I need a better way to record, but below are my average splits. Mile 4: not recorded because my phone died. Overall it was a great workout, and something that will only enhance my marathon training. 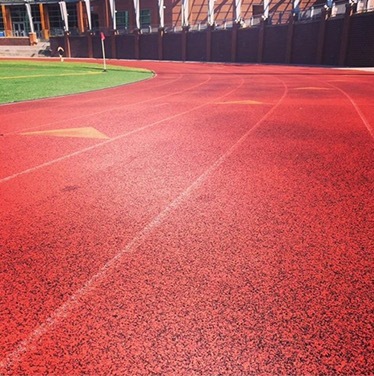 Do you do track workouts? Even, with the extreme heat conditions in the DC area, I ended week 4 of marathon training on a high note. I ran 6 days this week. 4 out of the 6 runs were stroller miles, with Zoe. The combination of stroller miles and the extreme summer heat is finally making me stronger and faster. Running a 6 mile (mid distance run) with the stroller, the day before my long run, made me confident and strong during my 11 mile long run. I was a little nervous about the heat. 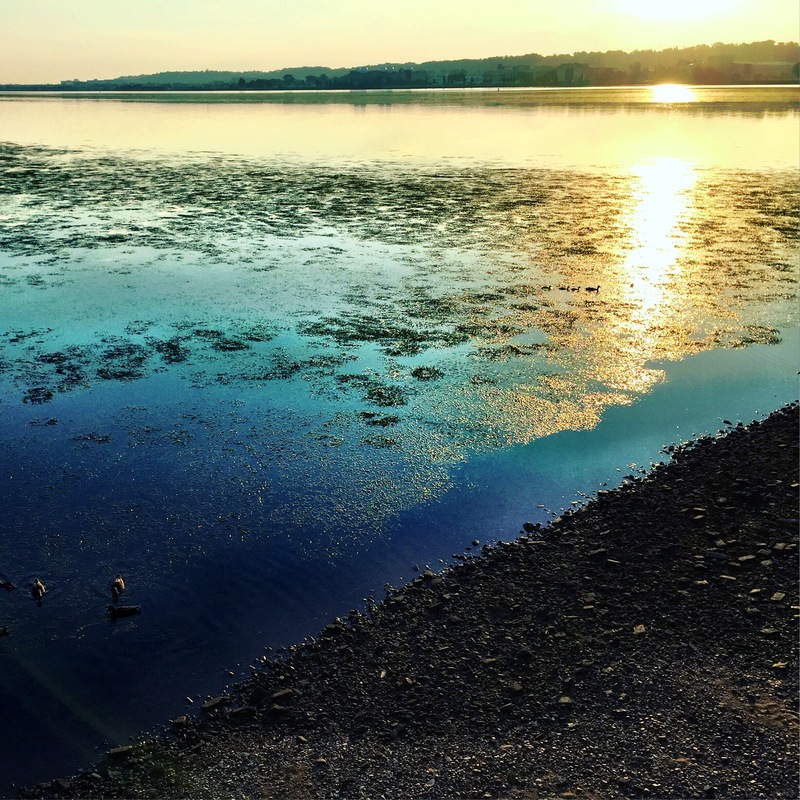 It was all over the news that the DC area was under a heat advisory, and that because of extreme humidity, the air quality was at dangerous levels. So I made sure on Saturday for my long run, I was out on the trail by 6:30 am. When I started my run it was in the high 70s, when I finished my run it was in the 90s. 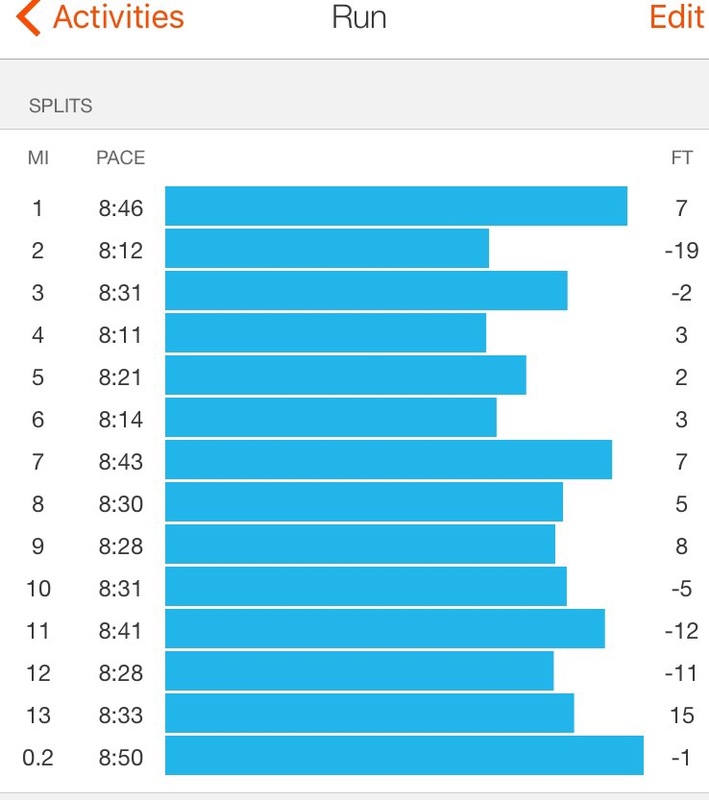 Most of my splits were at marathon pace, between 9:30-10. I’m actually really enjoying running early mornings. The city is quiet while everyone is still sleeping, but the trail is busy with all of us morning runners getting our long runs done. It’s such a great vibe, and the sun rises are so pretty. I hope everyone had great runs this week. Run Happy! !